The Marine Patrol is responsible for enforcing all watercraft laws within St. Joseph County. Marine Deputies patrol a majority of the 23 square miles of open waterways in St. Joseph County. The Sheriff’s Office provides education, enforcement of state and local statues, and safety through the Marine Patrol Division. 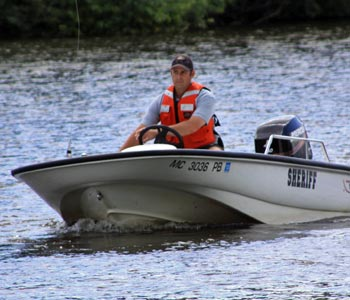 Marine Deputies investigate accidents that occur on the water, provide boater safety courses (free of charge) and conduct inspections of watercraft. Is the vessel legally registered? Does the vessel have the proper display of numbers? Is there proper equipment; including life jackets ( PFD's ) in the proper sizes, equaling the number of people on board? Is a fire extinguisher available if required? Are registration and boater’s safety certificates valid? Is the operator under the influence of alcohol or drugs?